Here we will keep you up-to-date on Dale Earnhardt Jr. stories, items of interest and progress during his 5 race 1999 Winston Cup debut. August 16, 1999 - Dale Earnhardt Jr will make his third Winston Cup start this weekend at Michigan Speedway. Matt Kenseth will also be making his Winston Cup debut at Michigan. Earnhardt Jr is the current Busch Grand National Series points leader and holds a one point lead over Kenseth. We could see a race within a race as these top two Busch Series contender go head to head in the Pepsi 400 August 22nd at Michigan. Dale Earnhardt Jr made his second Winston Cup appearance in the Jiffy Lube 300 at New Hampshire International Speedway. The day began with a lot of excitement as Dale Jr and Dale Earnhardt both occupied row 7, positions 13 and 14 in the starting line up for the event. Dale Jr added extra excitement a he rubbed and bumped his way past teammate, Steve Park, and his Father, Dale Earnhardt in the early laps of the race. Earnhardt Jr left tire and paint marks on the side of the #1 Pennzoil Monte Carlo and the #3 GM Goodwrench car. Unfortunately his day ended on lap 42 with a broken transmission and he was forced to retire from the race. Dale Earnhardt finished 8th. This was his 11th top-ten finish of the season. Dale Earnhardt Jr was testing at NHIS on Wednesday June 23rd and scraped the wall in the #8 Budweiser Monte Carlo but didn't do much damage to the car. Dale Jr posted the fastest reported test speed of 129.2 mph. ST. LOUIS - His successful debut behind him, Budweiser driver Dale Earnhardt Jr. is about to write the second chapter in his NASCAR Winston Cup career. Prior to attempting to qualify for the Jiffy Lube 300 on July 11 at New Hampshire International Speedway, he is hosting an online chat with race fans around the world. The chat comes on the heels of Earnhardt Jr.'s recent two-day test in Loudon, N.H., June 22-23. The chat will be from 7 p.m. to 8 p.m. (ET), June 30 at www.Excite.com . To participate, users will be required to register at the site in advance. Starting Line Up Dale Jr, 8th - Dale Earnhardt, 15th. Earnhardt, trying to make the field for his well-publicized and much-anticipated first Winston Cup race, had a 184.407 in his only allotted lap around Lowe's Motor Speedway at Charlotte. "I ain't never been that nervous in my life," said Earnhardt, whose lap guaranteed him the eighth starting spot in Sunday's 43-car field. It also put him seven spots ahead of his father, seven-time Winston Cup champion Dale Earnhardt. "In 600 miles we're bound to run into each other sooner or later--not literally, I hope," said Earnhardt, 24, who heightened expectations for his move up to NASCAR's top circuit by winning NASCAR's Busch Grand National title last year as a rookie. Dale Earnhardt Jr.'s souvenir trailer is parked just outside the main gates of Lowe's Motor Speedway, glistening in the morning sun as potential shoppers stroll by. And on that rig, there's no shortage of gear for sale. There's the obligatory Dale Jr. T-shirt and Dale Jr. hat, displayed next to pricier, perhaps more exclusive items such as $65 Dale Jr. diecast cars and $150 Dale Jr. jackets. But he's more interested in the item tucked into the corner of the display case -- a compact disc with three tracks, including a 10-minute interview of him and his friends' band, Bridge. After weeks -- months -- of hype, Dale Earnhardt Jr.'s NASCAR Winston Cup Series debut was thoroughly uneventful. And that was just fine with everyone involved. Earnhardt Jr. and the No. 8 Budweiser Chevrolet team did exactly what they set out to do in Sunday night's Coca-Cola 600 at Lowe's Motor Speedway. CONCORD, N.C. -- Steve Hmiel, technical director at Dale Earnhardt Inc., will pull double duty Sunday. Hmiel will work with his usual team, the No. 1 Chevrolets of Steve Park, but DEI added another member with the Winston Cup debut Sunday of Dale Earnhardt Jr. in the Coca-Cola 600. Park will start fifth Sunday, while Earnhardt Jr. will line up eighth. Early indications are that the $50 million-plus gamble was worth it. Dale Earnhardt Jr. took an important first step in his Winston Cup career by qualifying eighth for his inaugural race, the Coca-Cola 600 on Sunday at Lowe's Motor Speedway at Charlotte. Wednesday night's time trials capped more than six months of planning and hoopla surrounding the targeted series debut for the 24-year-old son of one of the sport's most famous champions. On Thursday, the relief was evident on the faces of everyone associated with the driver known as Little E.
The Dale Earnhardt Jr. marketing juggernaut is just getting up to speed. While not quite on par with the Second Coming, Little E's qualifying attempt and potential debut in this weekend's Coca-Cola 600 is receiving promotional muscle heretofore unseen in NASCAR. Apparently, the marketing guys have learned something since Jeff Gordon (quietly) started his first Winston Cup race and aren't going to let such an opportunity for star-making to go unchecked. Today Jim Sprick, brand manager, Budweiser marketing announced at Lowe's Motor Speedway that Budweiser has released a commemorative 16-oz can of the "King of Beers" featuring Earnhardt Jr.'s #8 Monte Carlo on it. One can forgive Dale Earnhardt Jr. if he feels a bit overwhelmed by now. Thrust into the limelight during his breakout season last year, the media circus that resulted is in many ways more difficult for a young man to handle than anything thrown at him on the track. But the brighter the spotlight becomes, the bigger the man they call "Little E" seems to come through. Two years ago nobody much cared what you did or when you did it and now you're 24 years old and suddenly it seems like somebody has scheduled your whole life without giving you any say in it and you've signed this big huge contract and you expected your life to be busy, and you're willing to do everything you're supposed to do but everybody has his limits and after all you know you have a championship to defend and a whole new world to conquer but everybody thinks you can do it all without so much as the slightest stumble and the worst thing is you can't get anybody to understand that you'll do whatever is expected of you if they'll just give you a minute every now and then to shut it all off and just chill. Dale Earnhardt has a picture of himself and his son, Dale Earnhardt Jr., together in Victory Lane in 1990 when Dale Sr. won the Winston Cup championship. ``They said he was 16 years old in that picture, but he looks 10,'' the elder Earnhardt said. ``In 1998, eight years later, he's the Grand National champion. That's hard to believe. At age 14, Dale Earnhardt Jr. roamed through the NASCAR Winston Cup Series garage, nachos in one hand and pizza in the other, begging his father's cohorts to let him wax their cars to a gleaming shine. Now, a decade later, he is set to compete against many of those same drivers, only now the aspirations of one day becoming a famous racer and waxing his own car have quickly transformed from fantasy into reality. This weekend, it is his time to shine. Dale Earnhardt Jr.'s life has changed in countless ways, ways in which even he probably doesn't yet realize. Two years ago, few pulled and tugged at him for interviews, autographs, commercials and the like. Two years from now, once he's made the jump to Winston Cup, the pressures he faces now will seem trivial, a picnic. The 1998 Busch Series champion will attempt tomake his Winston Cup debut in the May 30 Coca-Cola 600 at Lowe's Motor Speedway, and in some ways, he'll never look back. He'll compete for the Winston Cup circuit's Rookie of the Year title next year, giving the sport a highly anticipated boost in a brand-new millennium. Many consider Earnhardt racing's next mega-superstar, and he's already got the souvenir sales to prove it. Dale Earnhardt Jr. should be excused if he's nervous. After all, his jump to NASCAR's top series is the biggest step of his young career. Like many 24-year-olds, he's been known to party with friends and act a little crazy at times. But the third-generation stock car driver says he's ready for all the responsibilities of Winston Cup racing. He's been proclaimed as the savior of one series and the second coming of a stock-car superstar in another. Dale Earnhardt Jr. is carrying so much weight on his shoulders, he might as well be strapping his Chevrolet Monte Carlo onto his back rather than be strapping in behind the wheel before a race. 2/. 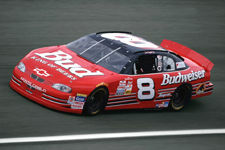 (8A) Dale Earnhardt Jr., Chevrolet, (5-6-1999) 181.470 mph. The ACDelco Online Chat session with Dale Earnhardt Jr. was postponed due to the death of Ralph Eury. ACDelco will continue to collect questions for Dale Earnhardt Jr. and will rescedule the online chat session. Please continue to check the ACDelco Web site (Dale Jr. Audio Chat) for the new date.